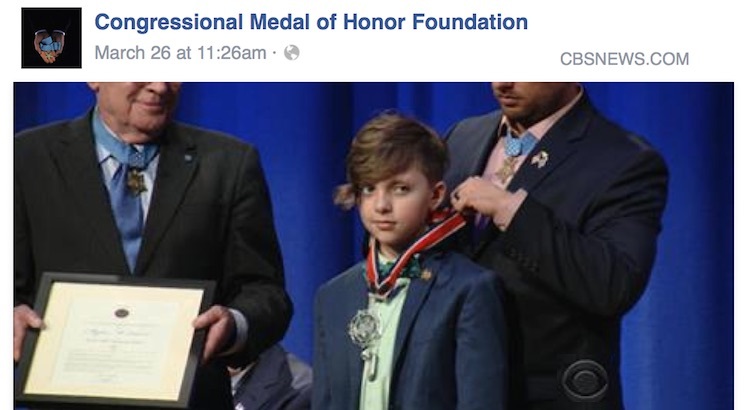 At a ceremony Friday, the Congressional Medal of Honor Foundation presented a special award to a young man who inspired a nation with a selfless gift to a soldier. Every year, the brotherhood of past military Medal of Honor recipients convenes to a different kind of medal–to recognize civilians who have gone above and beyond the call of duty. For the first time this year, one of those Citizen Honor awards went to a child, 10-year-old Myles Eckert. The Toledo, Ohio boy is known for his random act of kindness two years ago, when he found a twenty dollar bill in a restaurant parking lot and was excitedly dreaming of a new video game. He changed his mind when he saw a man in uniform. He wrote a note wrapped with the $20 and handed it to the stranger. Beyond that admirable act, young Myles was selected to receive the Young Hero Award for his volunteer philanthropic work on behalf of Gold Star children, kids whose parents died in the line of duty serving in the military. To date, Eckert has raised more than $2 million.